“Bodies can never be made of information alone, no matter which side of the computer screen they are on.” — N Katherine Hayles, How We Became Posthuman. The most captivating thing about Die Hard, for me, was always John McClane’s body. As he scampers all over Nakatomi Plaza, his body becomes a record of the story as it unfolds. The grease stain on his singlet is from when he crawled through an air vent; the blood down his arm is from the cut on his shoulder; the limp from the time he ran over broken glass. It set Die Hard apart from other action films. It’s story is no less ridiculous; McClane’s feats are no less unbelievable, but the injuries that his body and clothing took on during the film gave me as the audience a stake in McClane’s body—a stake in his world. It gave me an embodied context for his experiences. McClane affects his world, and his world affects him. In most videogames, like most stories, we experience the game’s world through the playable character’s bodily experiences. We understand that world through what our character’s body can do, through what the world can do to our character’s body. In third-person videogames, this works as much through what our character’s body is capable of doing as through how it looks. Spectating and performing converge and collide in fascinating ways; we understand their worlds through how they feel through the controller in our hands and the character’s body in our eyes. For action games, though, there is an extra hurdle. In games that are all about a character performing impossible violent feats, we need to believe in our character’s grounded, bodily existence even as they survive impossible ordeals. Most action game protagonists—like most action film protagonists—are, at the end of the day, invincible. And most action games—like most action films—take this necessary invincibility to mean the character can’t be injured. They allow the character’s body to affect their world but they don’t let the world reciprocally affect the character’s body. Our characters march through their worlds, leaving a trail of bodies, being touched by nothing. Like Halo’s Master Chief hiding under his body armour and regenerating shield, their flesh is static and unchanging. And so their invincibility reduces stories to amusement park rides. Plot points aren’t life events that leave a mark on our character but harmless attractions that we walk them past, confident they can’t hurt us. But life isn’t harmless. Life leaves marks on us, marks that shape where we are going as much as where we have been. Every body carries its own written history, be it the discoloured flesh of old scars, the restraints of old injuries, or the trauma of memories. We are an amalgamation of everyone we have ever been. Life isn’t harmless; stories shouldn’t be either. Stories depend on characters, and a story worth telling is one that has left some kind of mark on its character. It’s why Die Hard stands out against other action films: Die Hard leaves a mark on McClane. McClane might ultimately be as invincible as every other action film protagonist, but he doesn’t just walk through his story; he struggles to survive it. Die Hard’s story was captivating not because it was more believable than any other action film, but because it had a lasting effect on McClane’s life, on McClane’s body. The same is true for action games. Those I feel most attached to are those that actually affect my character’s body in some way. They don’t have to be weaker; death doesn’t have to be permanent. Story-driven action games can still have invincible protagonists but, like Die Hard, if I am looking at their body on the screen, I want that body to be inscribed with the story it is being steered through. I want my characters to feel pain. I want to know that the story has left a mark on them. I want Bioshock Infinite’s Booker DeWitt to be stabbed in the hand so I can see the blood-stained bandage every time he reloaded his shotgun. I want Metal Gear Solid 3’s Snake to lose an eye so that every time I use first-person mode the right-edge of the screen is blurred black. I don’t mind if my character is impossibly invincible, but I still need them to suffer. I need to know this story matters enough to them that they are willing to hurt for it. It’s what sells me on Martin Walker’s insane, stubborn determination to just keep going in Spec Ops: The Line. Walker ignores his orders and continues deeper and deeper into Dubai, which would just seem like an act of unthinking idiocy if he didn’t suffer for it. But Walker, at first, is cut and bruised. Then his clothes are ripped. Then, finally, half his face is burned off. But still he keeps walking, still I keep pushing him forward with a controller. In The Line, Walker isn’t just stubborn, but stubborn to such an extent that he doesn’t care about his own self-destruction. It’s what sells me on Max Payne’s terminal apathy in Max Payne 3. 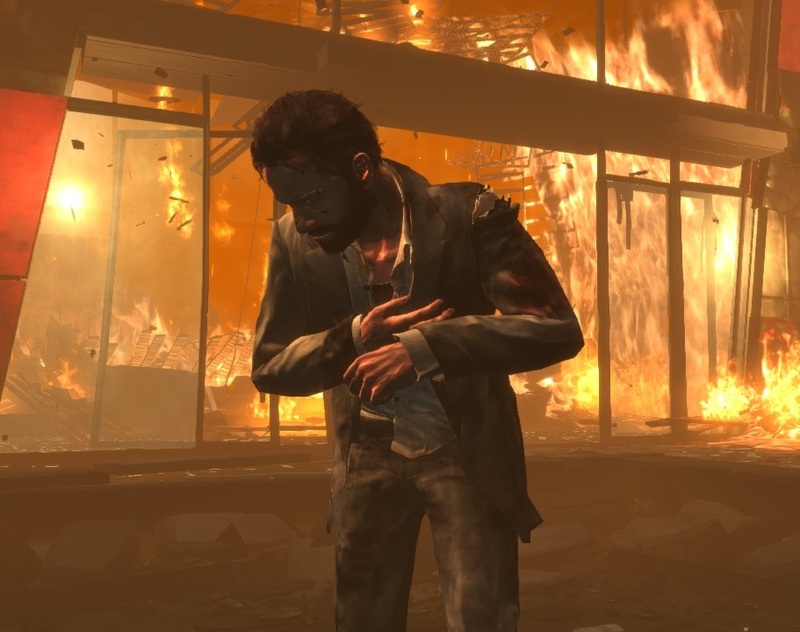 Despite Max’s alcohol and painkiller fueled invincibility, he feels vulnerable in a way very few action game characters feel. Blood-soaked bandages over wounds; a chunky, uneven haircut; the distortion of colour every few seconds from his painkillers. Max feels like he went over the edge a long time ago. He couldn’t care less about what happens to his body. He couldn’t care less what I do to his body. Max is only one ‘retry’ click away from immortality, but that doesn’t mean he can’t be hurt, and this story is going to hurt him. Significantly, ‘death’ and ‘injuries’ are not different qualities of the same unit of measurement. The deaths of these characters don’t mean anything to me. Walker’s deaths are uneventful; he just collapses in black and white. Max’s are gratuitous but quick: three comic book frames pounding across the screen showing exactly where the bullet penetrated his flesh to end his life. Death in these games is just a glitch in the system—me failing to do what the game demanded of me. Death is just a mistake. It is impermanent. It can be rectified. But the injuries of my characters, their pain, is lasting. That shows me that this story matters, that it has left a mark. It is why Lara Croft’s deaths in the most recent Tomb Raider are unnecessary. Lara, just like Max and Walker, is permitted a story that matters to her, a story that gives her scars and a history. But her deaths are long and overwrought. If I fail a quick-time event I must spend entire seconds watching a big, burly man strangle her to death; or a bizarrely sharp tree branch stabs through her abdomen; or an omniscient submerged rock is in the right place—always—to break her back. The thing is, while her bodily injuries make me more invested in her story, Lara’s deaths do not. This is a game about surviving, not dying. Why should I care about the death of an immortal? Her deaths are a waste of time, like being interrupted by a sneeze while reading a novel. Lara doesn’t die in this story. She survives. She survives and becomes someone she would not have become if this story did not happen. I am not invested in the story of Tomb Raider to see Lara die, but to see her survive in spite of incredible pain. I want to see my characters hurt. I want to see their world and their story inscribe themselves on their bodies. Not because I am interested in seeing them die, but because I want to see them invested in staying alive. The avatar’s body is my embodiment in the game’s story. It gives me something to hold onto that proves this world matters. As each character’s adventure leaves a mark on their body, it can’t help but leave a mark on me. I need my characters to hurt so that I know they are alive. Brendan Keogh is a game critic and academic. He's a PhD student at RMIT University, Melbourne, and has written for a variety of outlets including Edge, Unwinnable, and Paste. Find him on Twitter at @brkeogh.